Savvy CIOs are developing themselves into Cloud-enablers by honing their sourcing and service integration skills. 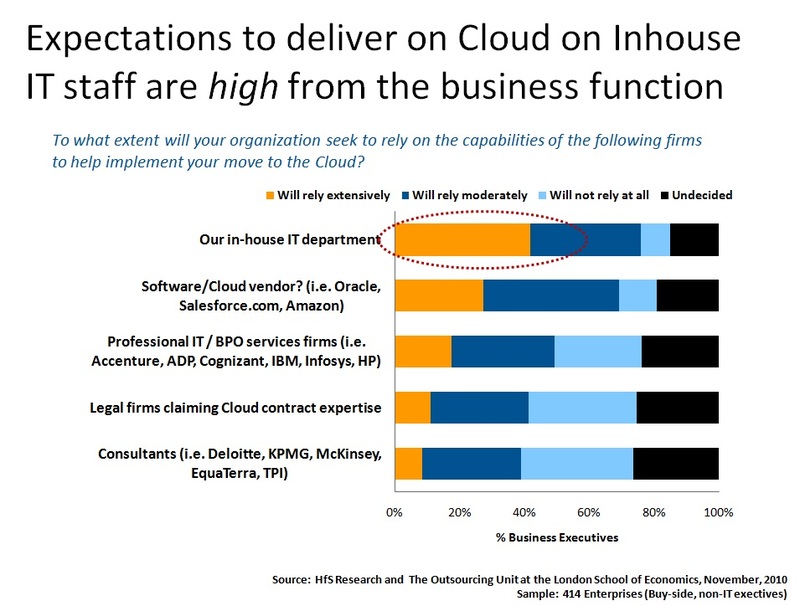 Our Cloud Business Services study, conducted in conjunction with the Outsourcing Unit at the London School of Economics, contrasts many differing views and expectations from business and IT executives about Cloud business services... however, both sides do agree on one thing — the crucial enablement role that IT executives must adopt in order to provision Cloud business services. HfS sees the future of the inhouse IT function as being the conduit between the business and the providers delivering Cloud business services. The successful IT executives will be those who develop governance expertise in sourcing and service integration to make Cloud a reality. Very telling data - I look forward to the full analysis of this study. Cloud brings new challenges to IT, as you suggest, but I also believe it gives it a very powerful opportunity for IT executives to get more involved with business process and aligning apps with the needs of the business user. Great data HfS! Kudos for running such a comprehensive survey. Interesting to note here the lesser intentions of business executives to turn to consultants for help, and go straight to the provider. Does this indicate consultants are not convincing clients of the value they offer with Cloud-enablement, or is it simply too early in the evolution towards Cloud environments? Interesting article. I completely agree with the point of bridging the growing gap between business demand and IT supply.